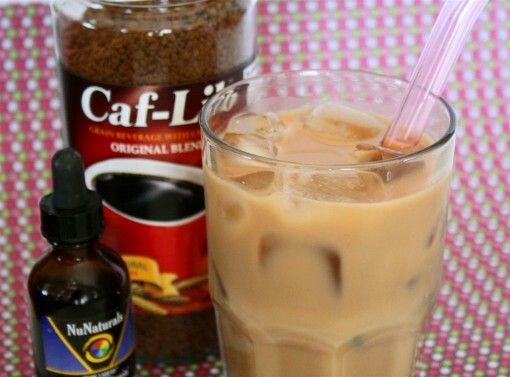 Caffeine-Free Vanilla Iced “Coffee” was posted on August 24th, 2012 and is filed under Dairy Free, Drinks & Smoothies, Recipes. This entry has 9 comments. You can follow any responses through the RSS 2.0 Comment Feed. There’s one fast food place I don’t especially appreciate. This would be McDonalds. However, I have to say that I like their salads when I’m in a pinch AND their iced coffees. Actually I really LOVE their iced coffees. On a hot day they are perfect – not too sweet and just a bit creamy. I have been having a lot of tea and coffee cold lately and it’s so refreshing! Before bed I try to avoid caffeine, but I still like my cold coffee. I find it’s a great liquid “dessert” and keeps me from snacking on other things. So here is my iced “coffee” drink that you can drink anytime without worrying about caffeine keeping you awake. It’s actually quite amazing how it really tastes like the McDonald’s iced coffee! I got really excited the first time I made it because I couldn’t believe how similar it tasted to the real deal. I also love the fact that this is a completely caffeine-free beverage, yet it tastes like coffee! One of my brothers (ex-coffee drinker) is actually allergic to caffeine so I’ll have to make this for him sometime and see what he thinks. I use our homemade almond milk for a very low calorie (yet creamy) beverage (think 15 calories! ), however when I’m feeling more decadent I use a splash of half and half (or cream) as well. Mix the nutmilk and stevia in a tall glass. Dissolve the Caf-Lib granules into the hot water and pour into the milk. Add ice till glass is full. Enjoy! If you don’t have Caf-Lib you can use Krakus as well. I love using these caffeine free beverages (I also love drinking real coffee, but that’s more of a treat – I usually use coffee alternatives). This weekend I’m off to run my first ever trail run, so wish me luck! Do you enjoy iced coffee? Do you try to avoid caffeine? This would be perfect for nighttime! I don’t try to avoid caffeine during the day but can’t sleep if I have it too late so this is great! I’ve never seen those coffee tabs before! I might have to try them out! Mmmm! Sounds fantastic! 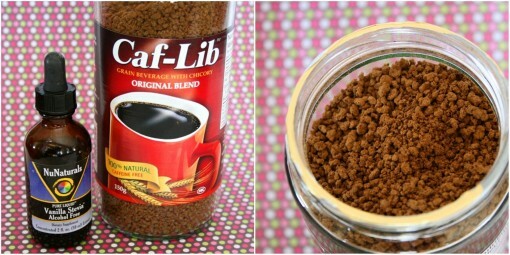 I keep thinking i need to get some instant coffee to keep for my emergency days when I run out of grounds or filters, but here’s a good idea of something to do with it even without an emergency! And I do love me some almond milk too! Plus, I also keep coming across recipes that use instant coffee… I believe the universe is trying to ad an item to my grocery list! YUM! I have recently gotten into decaf Earl Grey tea before bed but I love the idea of this ‘liquid dessert’. I think I’ll also add a dash of cinnamon, nutmeg and ginger for some added heat! I used to love iced coffee, but I gave up coffee years ago. I can probably count on one hand how many times I’ve had actual coffee in nearly a decade. I do still love the way it smells and enjoy coffee alternatives. I’d probably like this. I’ve never heard of Caf-Lib. This is a must-try! This is such a fun recipe! Saw it on Instagram and just had to come check it out!!! Looks amazing. I am with you…There is nothing I will eat at McDonald’s but I am addicted to their sugar free iced coffee. Thanks for the recipe, I will have to try it!